Tuesday – I know it seems hard to imagine with temperatures pushing the mid 60s and perhaps some 70s today, but the snow is still projected tomorrow night. The main storm still has us on the warm side with heavy rain to our wet and the Deep South. 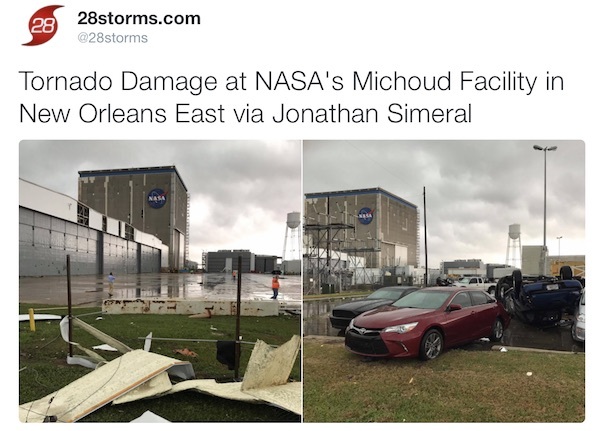 The New Orleans area was hit with a tornado, some reports of twin twisters at one time. One had damaged a NASA rocket making facility that made boosters for the Space Shuttle. The structure is intact, but the white facade was stripped away. This is is signal of the energy in the atmosphere and what abrupt changes are still very likely. Below are the latest images, including the forecast maps that still show a second Low and transition to snow for our region. UPDATE: At least 3 tornadoes touched down injuring 16 people in Louisiana. See additional coverage of this storm from 28Storms.com below the forecast. I want to stress the point again that what snow may fall will not all stick and accumulate. Road and air temperatures as still a key factor in this forecast. Yes, it will snow for many of us, with the heaviest on Thursday morning and showers lasting into the evening. This will impact traveling with low visibility in addition to the areas with slush and real stickage. But, I will wait to post my first call for snowfall until tonight. I have the National Weather Service snow maps at the bottom of this post. Temperatures: There has been an issue with local NWS Weather Station data reporting. So BWI is not on this list, but can be assumed that the record of 64°F will be broken. 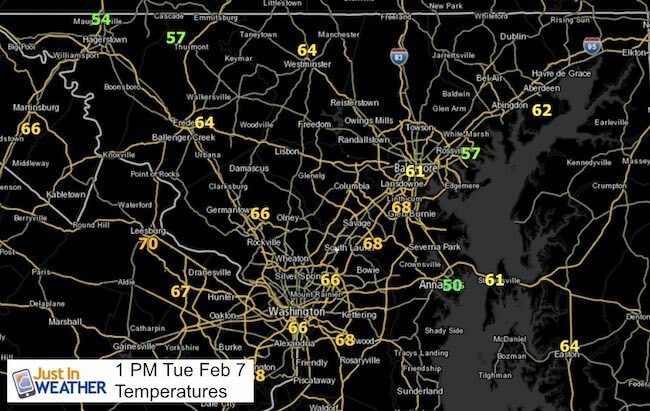 It should also be noted that it is much cooler (50s) right along the Chesapeake Bay. It is important to note that the modeling of the freezing line follows the typical boundary paralleling west and north of I-95. This follows the new split county advisory zones shown in this report. Notice the northern MD snow from Sterling VA does not match the southern PA forecast from State College. This may be attributed in part to still factoring in the ground temperatures. I will make my first call map tonight.